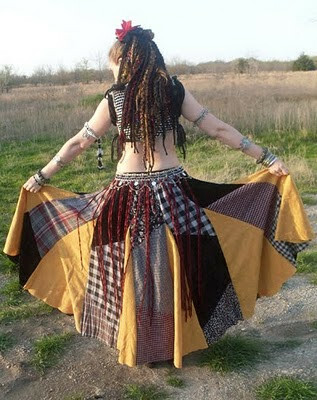 After my first attempt at reconstructing ordinary skirts into dance skirts for tribal, I started making one for my mom. It's a bright one! Sorta rodeo-clownish. 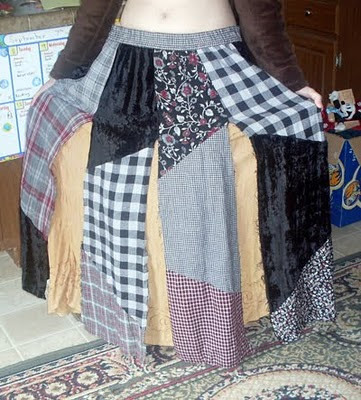 I started with a flannel patchwork skirt and spliced in some tablecloth to increase the circumference. Yes, you read that correctly. It is indeed an tablecloth I happened upon in my fabric stash. Thanks for looking! Comments are welcome and appreciated! I like it a lot! Love the color combo. Haha, Daughter_of_Apollo! Why not try one yourself? It's pretty easy. Seam ripping is the worst part. You could just make vertical cuts on any broomstick or full length skirt. Then, it's a matter of cutting wedge shapes to add in. I also had to add a drawstring (which is poking holes in the fabric in front of the elastic and fishing a shoelace through it) to the existing waistband to allow it to hold the extra weight. ElizabethsMom, I say "attempt" mostly because I really don't know what I'm doing until it's done. Just kinda wing it with what I have around. Plus, they ended up less than 10 yards at the hem. The first is about 8 yds. This one is is 9.5 yds., but should be over 10 yds. once the ruffle is added. I found some black flannel at a thrift store that I'm thinking of using. Ludi, I agree. At first, I was hesitant on using such a dominant gold color with all the plaid. But, I'm now liking the colors and the way it hangs together. I love the blend of colors. What a beautiful skirt! It suits you very well and I think that it's really cute that your mommy likes these kinds of skirts too. Nicely done and what a pretty blog you have too! 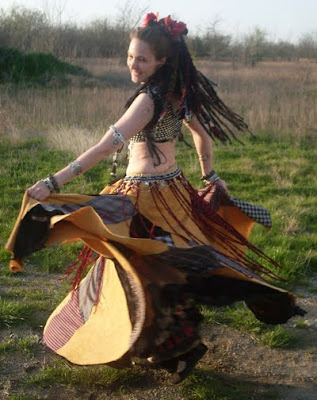 I think the little girl in all of us can't help but enjoy spinning and swishing around in skirts like these. Thank you, PixieSkull. I hope skills aren't required to wear these skirts. We just dance for fun and fitness. I'm aiming to keep improving my sewing and dance and other skills for the rest of my life.